A wealthy entrepreneur is found murdered in the study of his lavish New Jersey mansion. Suspects include a retinue of servants, a beautiful niece, a private secretary and a will. 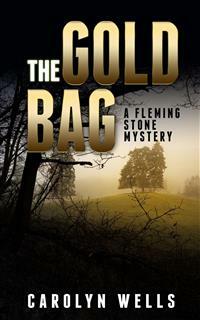 Circumstantial evidence in the shape of a gold mesh bag points to the niece, Florence Lloyd, being the murderer. But Detective Herbert Burroughs believes her innocent and centers his investigation on Florence’s fiance. Unable to prove his thesis, Burroughs calls upon famous sleuth Fleming Stone to solve the mystery that hinges on a gold bag and a pair of shoes. Curl up and enjoy this cozy mystery from the author of The Clue. The Gold Bag by Carolyn Wells. First published in 1911. This edition published 2017 by Enhanced Media Publishing. All rights reserved. Though a young detective, I am not entirely an inexperienced one, and I have several fairly successful investigations to my credit on the records of the Central Office. The Chief said to me one day: "Burroughs, if there's a mystery to be unraveled; I'd rather put it in your hands than to trust it to any other man on the force." "Because," he went on, "you go about it scientifically, and you never jump at conclusions, or accept them, until they're indubitably warranted." I declared myself duly grateful for the Chief's kind words, but I was secretly a bit chagrined. A detective's ambition is to be, considered capable of jumping at conclusions, only the conclusions must always prove to be correct ones. But though I am an earnest and painstaking worker, though my habits are methodical and systematic, and though I am indefatigably patient and persevering, I can never make those brilliant deductions from seemingly unimportant clues that Fleming Stone can. He holds that it is nothing but observation and logical inference, but to me it is little short of clairvoyance. The smallest detail in the way of evidence immediately connotes in his mind some important fact that is indisputable, but which would never have occurred to me. I suppose this is largely a natural bent of his brain, for I have not yet been able to achieve it, either by study or experience. Of course I can deduce some facts, and my colleagues often say I am rather clever at it, but they don't know Fleming Stone as well as I do, and don't realize that by comparison with his talent mine is insignificant. And so, it is both by way of entertainment, and in hope of learning from him, that I am with him whenever possible, and often ask him to "deduce" for me, even at risk of boring him, as, unless he is in the right mood, my requests sometimes do. I met him accidentally one morning when we both chanced to go into a basement of the Metropolis Hotel in New York to have our shoes shined. "Now, I suppose, Stone, from looking at those shoes, you can deduce all there is to know about the owner of them." "Those shoes belong to a young man, five feet eight inches high. He does not live in New York, but is here to visit his sweetheart. She lives in Brooklyn, is five feet nine inches tall, and is deaf in her left ear. They went to the theatre last night, and neither was in evening dress." "Oh, pshaw!" said I, "as you are acquainted with this man, and know how he spent last evening, your relation of the story doesn't interest me." "I don't know him," Stone returned; "I've no idea what his name is, I've never seen him, and except what I can read from these shoes I know nothing about him." "Tell this little Missourian all about it." "It did sound well, reeled off like that, didn't it?" he observed, chuckling more at my air of eager curiosity than at his own achievement. "But it's absurdly easy, after all. He is a young man because his shoes are in the very latest, extreme, not exclusive style. He is five feet eight, because the size of his foot goes with that height of man, which, by the way, is the height of nine out of ten men, anyway. He doesn't live in New York or he wouldn't be stopping at a hotel. Besides, he would be down-town at this hour, attending to business." "Unless he has freak business hours, as you and I do," I put in. "Yes, that might be. But I still hold that he doesn't live in New York, or he couldn't be staying at this Broadway hotel overnight, and sending his shoes down to be shined at half-past nine in the morning. His sweetheart is five feet nine, for that is the height of a tall girl. I know she is tall, for she wears a long skirt. Short girls wear short skirts, which make them look shorter still, and tall girls wear very long skirts, which make them look taller." "Why do they do that?" I inquired, greatly interested. "I don't know. You'll have to ask that of someone wiser than I. But I know it's a fact. A girl wouldn't be considered really tall if less than five feet nine. So I know that's her height. She is his sweetheart, for no man would go from New York to Brooklyn and bring a lady over here to the theatre, and then take her home, and return to New York in the early hours of the morning, if he were not in love with her. I know she lives in Brooklyn, for the paper says there was a heavy shower there last night, while I know no rain fell in New York. I know that they were out in that rain, for her long skirt became muddy, and in turn muddied the whole upper of his left shoe. The fact that only the left shoe is so soiled proves that he walked only at her right side, showing that she must be deaf in her left ear, or he would have walked part of the time on that side. I know that they went to the theatre in New York, because he is still sleeping at this hour, and has sent his boots down to be cleaned, instead of coming down with them on his feet to be shined here. If he had been merely calling on the girl in Brooklyn, he would have been home early, for they do not sit up late in that borough. I know they went to the theatre, instead of to the opera or a ball, for they did not go in a cab, otherwise her skirt would not have become muddied. This, too, shows that she wore a cloth skirt, and as his shoes are not patent leathers, it is clear that neither was in evening dress." I didn't try to get a verification of Fleming Stone's assertions; I didn't want any. Scores of times I had known him to make similar deductions and in cases where we afterward learned the facts, he was invariably correct. So, though we didn't follow up this matter, I was sure he was right, and, even if he hadn't been, it would not have weighed heavily against his large proportion of proved successes. We separated then, as we took chairs at some distance from each other, and, with a sigh of regret that I could never hope to go far along the line in which Stone showed such proficiency, I began to read my morning paper. Fleming Stone left the place before I did, nodding a good-by as he passed me, and a moment after, my own foot-gear being in proper condition, I, too, went out, and went straight to my office. As I walked the short distance, my mind dwelt on Stone's quick-witted work. Again I wished that I possessed the kind of intelligence that makes that sort of thing so easy. Although unusual, it is, after all, a trait of many minds, though often, perhaps, unrecognized and undeveloped by its owner. I dare say it lies dormant in men who have never had occasion to realize its value. Indeed, it is of no continuous value to anyone but a detective, and nine detectives out of ten do not possess it. So I walked along, envying my friend Stone his gift, and reached my office just at ten o'clock as was my almost invariable habit. "Hurry up, Mr. Burroughs!" cried my office-boy, as I opened the door. "You're wanted on the telephone." Though a respectful and well-mannered boy, some excitement had made him a trifle unceremonious, and I looked at him curiously as I took up the receiver. But with the first words I heard, the office-boy was forgotten, and my own nerves received a shock as I listened to the message. It was from the Detective Bureau with which I was connected, and the superintendent himself was directing me to go at once to West Sedgwick, where a terrible crime had just been discovered. "Killed!" I exclaimed; "Joseph Crawford?" "Yes; murdered in his home in West Sedgwick. The coroner telephoned to send a detective at once and we want you to go." "Of course I'll go. Do you know any more details?" "No; only that he was shot during the night and the body found this morning. Mr. Crawford was a big man, you know. Go right off, Mr. Burroughs; we want you to lose no time." Yes; I knew Joseph Crawford by name, though not personally, and I knew he was a big man in the business world, and his sudden death would mean excitement in Wall Street matters. Of his home, or home-life, I knew nothing. "I'll go right off," I assured the Chief, and turned away from the telephone to find Donovan, the office-boy, already looking up trains in a timetable. "Good boy, Don," said I approvingly; "what's the next train to West Sedgwick, and how long does it take to get there?" "You kin s'lect the ten-twenty, Mr. Burruz, if you whirl over in a taxi an' shoot the tunnel," said Donovan, who was rather a graphic conversationalist. "That'll spill you out at West Sedgwick 'bout quarter of 'leven. Was he moidered, Mr. Burruz?" "So they tell me, Don. His death will mean something in financial circles." "Yes sir. He was a big plute. Here's your time-table, Mr. Burruz. When'll you be back?" "Don't know, Don. You look after things." "Sure! everything'll be took care of. Lemme know your orders when you have 'em." By means of the taxi Don had called and the tunnel route as he had suggested, I caught the train, satisfied that I had obeyed the Chief's orders to lose no time. Lose no time indeed! I was more anxious than anyone else could possibly be to reach the scene of the crime before significant clues were obliterated or destroyed by bungling investigators. I had had experience with the police of suburban towns, and I well knew their two principal types. Either they were of a pompous, dignified demeanor, which covered a bewildered ignorance, or else they were overzealous and worked with a misdirected energy that made serious trouble for an intelligent detective. Of course, of the two kinds I preferred the former, but the danger was that I should encounter both. On my way I diverted my mind, and so partly forgot my impatience, by endeavoring to "deduce" the station or occupation of my fellow passengers. Opposite me in the tunnel train sat a mild-faced gentleman, and from the general, appearance of his head and hat I concluded he was a clergyman. I studied him unostentatiously and tried to find some indication of the denomination he might belong to, or the character of his congregation, but as I watched, I saw him draw a sporting paper from his pocket, and turning his hand, a hitherto unseen diamond flashed brilliantly from his little finger. I hastily, revised my judgment, and turning slightly observed the man who sat next me. Determined to draw only logical inferences, I scrutinized his coat, that garment being usually highly suggestive to our best regulated detectives. I noticed that while the left sleeve was unworn and in good condition, the right sleeve was frayed at the inside edge, and excessively smooth and shiny on the inner forearm. Also the top button of the coat was very much worn, and the next one slightly. "A-ha!" said I to myself, "I've nailed you, my friend. You're a desk-clerk, and you write all day long, standing at a desk. The worn top button rubs against your desk as you stand, which it would not do were you seated." With a pardonable curiosity to learn if I were right, I opened conversation with the young man. He was not unwilling to respond, and after a few questions I learned, to my chagrin, that he was a photographer. Alas for my deductions! But surely, Fleming Stone himself would not have guessed a photographer from a worn and shiny coat-sleeve. At the risk of being rudely personal, I made some reference to fashions in coats. The young man smiled and remarked incidentally, that owing to certain circumstances he was at the moment wearing his brother's coat. He gave me a surprised glance, but answered courteously enough, "Yes;" and the conversation flagged. Exultantly I thought that my deduction, though rather an obvious one, was right; but after another furtive glance at the young man, I realized that Stone would have known he was wearing another's coat, for it was the most glaring misfit in every way. Once more I tried, and directed my attention to a middle-aged, angular-looking woman, whose strong, sharp-featured face betokened a prim spinster, probably at the head of a girls' school, or engaged in some clerical work. However, as I passed her on my way to leave the train I noticed a wedding-ring on her hand, and heard her say to her companion, "No; I think a woman's sphere is in her own kitchen and nursery. How could I think otherwise, with my six children to bring up?" After these lamentable failures, I determined not to trust much to deduction in the case I was about to investigate, but to learn actual facts from actual evidence. I reached West Sedgwick, as Donovan had said, at quarter before eleven. Though I had never been there before, the place looked quite as I had imagined it. The railway station was one of those modern attractive structures of rough gray stone, with picturesque projecting roof and broad, clean platforms. A flight of stone steps led down to the roadway, and the landscape in every direction showed the well-kept roads, the well-grown trees and the carefully-tended estates of a town of suburban homes. The citizens were doubtless mainly men whose business was in New York, but who preferred not to live there. The superintendent must have apprised the coroner by telephone of my immediate arrival, for a village cart from the Crawford establishment was awaiting me, and a smart groom approached and asked if I were Mr. Herbert Burroughs. A little disappointed at having no more desirable companion on my way to the house, I climbed up beside the driver, and the groom solemnly took his place behind. Not curiosity, but a justifiable desire to learn the main facts of the case as soon as possible, led me to question the man beside me. I glanced at him first and saw only the usual blank countenance of the well-trained coachman. His face was intelligent, and his eyes alert, but his impassive expression showed his habit of controlling any indication of interest in people or things. I felt there would be difficulty in ingratiating myself at all, but I felt sure that subterfuge would not help me, so I spoke directly. "You are the coachman of the late Mr. Crawford?" I hadn't really expected more than this in words, but his tone was so decidedly uninviting of further conversation that I almost concluded to say nothing more. But the drive promised to be a fairly long one, so I made another effort. "As the detective on this case, I wish to hear the story of it as soon as I can. Perhaps you can give me a brief outline of what happened." It was perhaps my straightforward manner, and my quite apparent assumption of his intelligence, that made the man relax a little and reply in a more conversational tone. "We're forbidden to chatter, sir," he said, "but, bein' as you're the detective, I s'pose there's no harm. But it's little we know, after all. The master was well and sound last evenin', and this mornin' he was found dead in his own office-chair." "You mean a private office in his home?" "Yes, sir. Mr. Crawford went to his office in New York 'most every day, but days when he didn't go, and evenin's and Sundays, he was much in his office at home, sir." "I don't rightly know, sir, if it was Louis, his valet, or Lambert, the butler, but it was one or t'other, sir." "Or both together?" I suggested. "Yes, sir; or both together." "Is anyone suspected of the crime?" "Not as I knows on, sir." "Tell me something of the town," I observed next, feeling that it was better to ask no more vital questions of a servant. We were driving along streets of great beauty. Large and handsome dwellings, each set in the midst of extensive and finely-kept grounds, met the view on either aide. Elaborate entrances opened the way to wide sweeps of driveway circling green velvety lawns adorned with occasional shrubs or flower-beds. The avenues were wide, and bordered with trees carefully set out and properly trimmed. The streets were in fine condition, and everything betokened a community, not only wealthy, but intelligent and public-spirited. Surely West Sedgwick was a delightful location for the homes of wealthy New York business men. "Well, sir," said the coachman, with unconcealed pride, "Mr. Crawford was the head of everything in the place. His is the handsomest house and the grandest grounds. Everybody respected him and looked up to him. He hadn't an enemy in the world." This was an opening for further conjecture as to the murderer, and I said: "But the man who killed him must have been his enemy." "Yes, sir; but I mean no enemy that anybody knew of. It must have been some burglar or intruder." Though I wanted to learn such facts as the coachman might know, his opinions did not interest me, and I again turned my attention to the beautiful residences we were passing. "That place over there," the man went on, pointing with his whip, "is Mr. Philip Crawford's house—the brother of my master, sir. Them red towers, sticking up through the trees, is the house of Mr. Lemuel Porter, a great friend of both the Crawford brothers. Next, on the left, is the home of Horace Hamilton, the great electrician. Oh, Sedgwick is full of well-known men, sir, but Joseph Crawford was king of this town. Nobody'll deny that." I knew of Mr. Crawford's high standing in the city, and now, learning of his local preeminence, I began to think I was about to engage in what would probably be a very important case. "Here we are, sir," said the driver, as we turned in at a fine stone gateway. "This is the Joseph Crawford place." He spoke with a sort of reverent pride, and I afterward learned that his devotion to his late master was truly exceptional. This probably prejudiced him in favor of the Crawford place and all its appurtenances, for, to me, the estate was not so magnificent as some of the others we had passed. And yet, though not so large, I soon realized that every detail of art or architecture was perfect in its way, and that it was really a gem of a country home to which I had been brought. We drove along a curving road to the house, passing well-arranged flower beds, and many valuable trees and shrubs. Reaching the porte cochere the driver stopped, and the groom sprang down to hand me out. As might be expected, many people were about. Men stood talking in groups on the veranda, while messengers were seen hastily coming or going through the open front doors. A waiting servant in the hall at once ushered me into a large room. The effect of the interior of the house impressed me pleasantly. As I passed through the wide hall and into the drawing-room, I was conscious of an atmosphere of wealth tempered by good taste and judgment. The drawing-room was elaborate, though not ostentatious, and seemed well adapted as a social setting for Joseph Crawford and his family. It should have been inhabited by men and women in gala dress and with smiling society manners. It was therefore a jarring note when I perceived its only occupant to be a commonplace looking man, in an ill-cut and ill-fitting business suit. He came forward to greet me, and his manner was a trifle pompous as he announced, "My name is Monroe, and I am the coroner. You, I think, are Mr. Burroughs, from New York." It was probably not intentional, and may have been my imagination, but his tone seemed to me amusingly patronizing. "Yes, I am Mr. Burroughs," I said, and I looked at Mr. Monroe with what I hoped was an expression that would assure him that our stations were at least equal. I fear I impressed him but slightly, for he went on to tell me that he knew of my reputation as a clever detective, and had especially desired my attendance on this case. This sentiment was well enough, but he still kept up his air and tone of patronage, which however amused more than irritated me. I knew the man by hearsay, though we had never met before; and I knew that he was of a nature to be pleased with his own prominence as coroner, especially in the case of so important a man as Joseph Crawford. So I made allowance for this harmless conceit on his part, and was even willing to cater to it a little by way of pleasing him. He seemed to me a man, honest, but slow of thought; rather practical and serious, and though overvaluing his own importance, yet not opinionated or stubborn. "Mr. Burroughs," he said, "I'm very glad you could get here so promptly; for the case seems to me a mysterious one, and the value of immediate investigation cannot be overestimated." "I quite agree with you," I returned. "And now will you tell me the principal facts, as you know them, or will you depute someone else to do so?" "I am even now getting a jury together," he said, "and so you will be able to hear all that the witnesses may say in their presence. In the meantime, if you wish to visit the scene of the crime, Mr. Parmalee will take you there." At the sound of his name, Mr. Parmalee stepped forward and was introduced to me. He proved to be a local detective, a young man who always attended Coroner Monroe on occasions like the present; but who, owing to the rarity of such occasions in West Sedgwick, had had little experience in criminal investigation. He was a young man of the type often seen among Americans. He was very fair, with a pink complexion, thin, yellow hair and weak eyes. His manner was nervously alert, and though he often began to speak with an air of positiveness, he frequently seemed to weaken, and wound up his sentences in a floundering uncertainty. He seemed to be in no way jealous of my presence there, and indeed spoke to me with an air of comradeship. Doubtless I was unreasonable, but I secretly resented this. However I did not show my resentment and endeavored to treat Mr. Parmalee as a friend and co-worker. The coroner had left us together, and we stood in the drawing-room, talking, or rather he talked and I listened. Upon acquaintance he seemed to grow more attractive. He was impulsive and jumped at conclusions, but he seemed to have ideas, though they were rarely definitely expressed. He told me as much as he knew of the details of the affair and proposed that we go directly to the scene of the crime. As this was what I was impatient to do, I consented. "You see, it's this way," he said, in a confidential whisper, as we traversed the long hall: "there is no doubt in any one's mind as to who committed the murder, but no name has been mentioned yet, and nobody wants to be the first to say that name. It'll come out at the inquest, of course, and then—"
"But," I interrupted, "if the identity of the murderer is so certain, why did they send for me in such haste?" "Oh, that was the coroner's doing. He's a bit inclined to the spectacular, is Monroe, and he wants to make the whole affair as important as possible." "But surely, Mr. Parmalee, if you are certain of the criminal it is very absurd for me to take up the case at all." "Oh, well, Mr. Burroughs, as I say, no name has been spoken yet. And, too, a big case like this ought to have a city detective on it. Even if you only corroborate what we all feel sure of, it will prove to the public mind that it must be so." "Tell me then, who is your suspect?" "Oh, no, since you are here you had better investigate with an unprejudiced mind. Though you cannot help arriving at the inevitable conclusion." We had now reached a closed door, and, at Mr. Parmalee's tap, were admitted by the inspector who was in charge of the room. It was a beautiful apartment, far too rich and elaborate to be designated by the name of "office," as it was called by everyone who spoke of it; though of course it was Mr. Crawford's office, as was shown by the immense table-desk of dark mahogany, and all the other paraphernalia of a banker's work-room, from ticker to typewriter. But the decorations of walls and ceilings, the stained glass of the windows, the pictures, rugs, and vases, all betokened luxurious tastes that are rarely indulged in office furnishings. The room was flooded with sunlight. Long French windows gave access to a side veranda, which in turn led down to a beautiful terrace and formal garden. But all these things were seen only in a hurried glance, and then my eyes fell on the tragic figure in the desk chair. The body had not been moved, and would not be until after the jury had seen it, and though a ghastly sight, because of a bullet-hole in the left temple, otherwise it looked much as Mr. Crawford must have looked in life. A handsome man, of large physique and strong, stern face, he must have been surprised, and killed instantly; for surely, given the chance, he would have lacked neither courage nor strength to grapple with an assailant. I felt a deep impulse of sympathy for that splendid specimen of humanity, taken unawares, without having been given a moment in which to fight for his life, and yet presumably seeing his murderer, as he seemed to have been shot directly from the front. As I looked at that noble face, serene and dignified in its death pallor, I felt glad that my profession was such as might lead to the avenging of such a detestable crime. And suddenly I had a revulsion of feeling against such petty methods as deductions from trifling clues. Moreover I remembered my totally mistaken deductions of that very morning. Let other detectives learn the truth by such claptrap means if they choose. This case was too large and too serious to be allowed to depend on surmises so liable to be mistaken. No, I would search for real evidence, human testimony, reliable witnesses, and so thorough, systematic, and persevering should my search be, that I would finally meet with success. "Here's the clue," said Parmelee's voice, as he grasped my arm and turned me in another direction. He pointed to a glittering article on the large desk. It was a woman's purse, or bag, of the sort known as "gold-mesh." Perhaps six inches square, it bulged as if overcrowded with some feminine paraphernalia. "It's Miss Lloyd's," went on Parmalee. "She lives here, you know—Mr. Crawford's niece. She's lived here for years and years." "And you suspect her?" I said, horrified. "Well, you see, she's engaged to Gregory Hall he's Mr. Crawford's secretary—and Mr. Crawford didn't approve of the match; and so—"
He shrugged his shoulders in a careless fashion, as if for a woman to shoot her uncle were an everyday affair. But I was shocked and incredulous, and said so. "Where is Miss Lloyd?" I asked. "Does she claim ownership of this gold bag?" "No; of course not," returned Parmalee. "She's no fool, Florence Lloyd isn't! She's locked in her room and won't come out. Been there all the morning. Her maid says this isn't Miss Lloyd's bag, but of course she'd say that." "Well, that question ought to be easily settled. What's in the bag?" "Look for yourself. Monroe and I ran through the stuff, but there's nothing to say for sure whose bag it is." I opened the pretty bauble, and let the contents fall out on the desk. A crumpled handkerchief, a pair of white kid gloves, a little trinket known as a "vanity case," containing a tiny mirror and a tinier powder puff; a couple of small hair-pins, a newspaper clipping, and a few silver coins were all that rewarded my trouble. Nothing definite, indeed, and yet I knew if Fleming Stone could look at the little heap of feminine belongings, he would at once tell the fair owner's age, height, and weight, if not her name and address. I had only recently assured myself that such deductions were of little or no use, and yet, I could not help minutely examining the pretty trifles lying on the desk. I scrutinized the handkerchief for a monogram or an initial, but it had none. It was dainty, plain and fine, of sheer linen, with a narrow hem. To me it indicated an owner of a refined, feminine type, and absolutely nothing more. I couldn't help thinking that even Fleming Stone could not infer any personal characteristics of the lady from that blank square of linen. The vanity case I knew to be a fad of fashionable women, and had that been monogrammed, it might have proved a clue. But, though pretty, it was evidently not of any great value, and was merely such a trifle as the average woman would carry about. And yet I felt exasperated that with so many articles to study, I could learn nothing of the individual to whom they belonged. The gloves were hopeless. Of a good quality and a medium size, they seemed to tell me nothing. They were but slightly soiled, and apparently might have been worn once or twice. They had never been cleaned, as the inside showed no scrawled hieroglyphics. But all of these conclusions pointed nowhere save to the average well-groomed American woman. The hair-pins and the silver money were equally bare of suggestion, but I hopefully picked up the bit of newspaper. "Surely this newspaper clipping must throw some light," I mused, but it proved to be only the address of a dyeing and cleaning establishment in New York City. "Yes, sir! Nobody touches a thing in this: room while I'm here. You, sir, are of course an exception, but no one else is allowed to meddle with anything." This reminded me that as the detective in charge of this case, it was my privilege—indeed, my duty—to examine the papers and personal effects that were all about, in an effort to gather clues for future use. I was ignorant of many important details, and turned to Parmelee for information. That young man however, though voluble, was, inclined to talk on only one subject, the suspected criminal, Miss Florence Lloyd. "You see, it must be her bag. Because who else could have left it here? Mrs. Pierce, the only other lady in the house, doesn't carry a youngish bag like that. She'd have a black leather bag, more likely, or a— or a—"
"Well, it really doesn't matter what kind of a bag Mrs. Pierce would carry," said I, a little impatiently; "the thing is to prove whether this is Miss Lloyd's bag or not. And as it is certainly not a matter of conjecture, but a matter of fact, I think we may leave it for the present, and turn our attention to other matters." I could see that Parmalee was disappointed that I had made no startling deductions from my study of the bag and its contents, and, partly owing to my own chagrin at this state of affairs, I pretended to consider the bag of little consequence, and turned hopefully to an investigation of the room. The right-hand upper drawer of the double-pedestalled desk was open. Seemingly, Mr. Crawford had been engaged with its contents during the latter moments of his life. At a glance, I saw the drawer contained exceedingly valuable and important papers. With an air of authority, intentionally exaggerated for the purpose of impressing Parmalee, I closed the drawer, and locked it with the key already in the keyhole. This key was one of several on a key-ring, and, taking it from its place, I dropped the whole bunch in my pocket. This action at once put me in my rightful place. The two men watching me unconsciously assumed a more deferential air, and, though they said nothing, I could see that their respect for my authority had increased. Strangely enough, after this episode, a new confidence in my own powers took possession of me, and, shaking off the apathy that had come over me at sight of that dread figure in the chair, I set methodically to work to examine the room. Of course I noted the position of the furniture, the state of the window-fastenings, and such things in a few moments. The many filing cabinets and indexed boxes, I glanced at, and locked those that had keys or fastenings. The inspector sat with folded hands watching me with interest but saying nothing. Parmalee, on the other hand, kept up a running conversation, sometimes remarking lightly on my actions, and again returning to the subject of Miss Lloyd. "I can see," he said, "that you naturally dislike to suspect a woman, and a young woman too. But you don't know Miss Lloyd. She is haughty and willful. And as I told you, nobody has mentioned her yet in this connection. But I am speaking to you alone, and I have no reason to mince matters. And you know Florence Lloyd is not of the Crawford stock. The Crawfords are a fine old family, and not one of them could be capable of crime. But Miss Lloyd is on the other side of the house, a niece of Mrs. Crawford; and I've heard that the Lloyd stock is not all that could be desired. There is a great deal in heredity, and she may not be responsible..."
I paid little attention to Parmalee's talk, which was thrown at me in jerky, desultory sentences, and interested me not at all. I went on with my work of investigation, and though I did not get down on my knees and examine every square inch of the carpet with a lens, yet I thoroughly examined all of the contents of the room. I regret to say, however, that I found nothing that seemed to be a clue to the murderer. Stepping out on the veranda, I looked for footprints. The "light snow" usually so helpful to a detective had not fallen, as it was April, and rather warm for the season. But I found many heel marks, apparently of men's boots; yet they were not necessarily of very recent date, and I don't think much of foot-print clues, anyhow. Then I examined the carpet, or, rather, the several rugs which ornamented the beautiful polished floor. I found nothing but two petals of a pale yellow rose. They were crumpled, but not dry or withered, and could not have been long detached from the blossom on which they grew. Parmalee chanced to have his back toward me as I spied them, and I picked them up and put them away in my pocket-book without his knowledge. If the stolid inspector saw me, he made no sign. Indeed, I think he would have said nothing if I had carried off the big desk itself. I looked round the room for a bouquet or vase of flowers from which the petals might have fallen, but none was there. This far I had progressed when I heard steps in the hall, and a moment later the coroner ushered the six gentlemen of his jury into the room. It was just as the men came in at the door, that I chanced to notice a newspaper that lay on a small table. I picked it up with an apparent air of carelessness, and, watching my chance, unobserved by Parmalee, I put the paper away in a drawer, which I locked. The six men, whom Coroner Monroe named over to me, by way of a brief introduction, stepped silently as they filed past the body of their late friend and neighbor. For the jurymen had been gathered hastily from among the citizens of West Sedgwick who chanced to be passing; and as it was after eleven o'clock, they were, for the most part, men of leisure, and occupants of the handsome homes in the vicinity. Probably none of them had ever before been called to act on a coroner's jury, and all seemed impressed with the awfulness of the crime, as well as imbued with a personal sense of sorrow.